Blue and white porcelain has been an inspiration for beautiful textiles for hundreds of years and every generation finds a way to make that inspiration look unique and fresh. 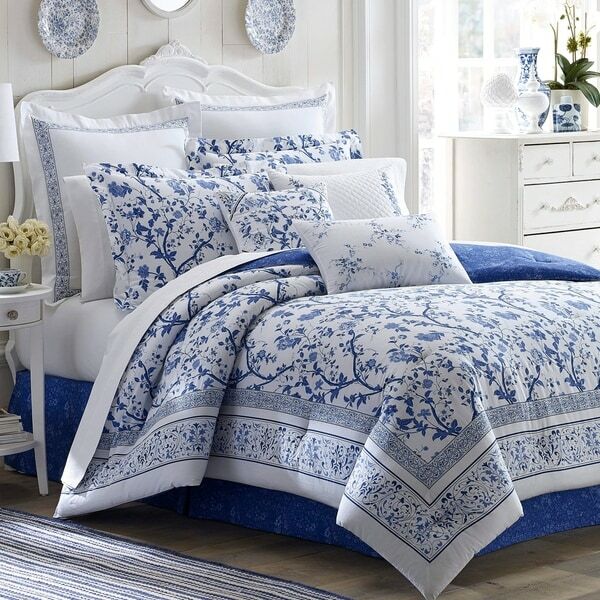 Laura Ashley's Charlotte ensemble proves the timeless appeal of this look for the 21st century bedroom. Duvet cover features button and tie closure. Machine washable for easy care. Duvet Cover Set includes: One twin duvet cover (86"X66") and one standard sham (21"X27"). Full/Queen Duvet Cover Set includes: One full/queen duvet cover (92"X88") and two standard shams (21"X27"). King Duvet Cover Set includes: One king duvet cover (92"X106") and two king shams (21"X37"). Beautiful set, just as pretty in person as on the pictures. There are times in the corners to hold your blanket. The buttons are sewn on well which makes me happy I hate to have to get out my needle and thread to fix a brand new item! I washed it before placing on bed and was pleased to see very light wrinkling!! In fact after putting in my cover and making up the bed the next day gravity had my bed looking crisp and fresh!!! I also purchased the matching pillows and WOW my bed room is light and airy! Another great product! "Does the king size duvet have enough overhang to cover a 10 inch mattress at 92 wide it seems like it would not? What has been your experience?" It would be a couple inches short on each side. A fresh new look for my bedroom! "I thought the bed skirt came with the set"
I comes with the comforter set, not the duvet set. "How much is a bed skirt for a full size bed?"